CustomTech Blog: NoMachine 5 Released! Native GUI - The NoMachine interface has been given a native look-and-feel on all platforms. The traditional 'Dark' theme is still available as optional in the NoMachine Player Preferences. Internationalization - Support for international languages has been added with menus and dialogs now available in French, Spanish, Italian, Polish, Russian, Portuguese and German. Improved multi-monitor support - Users of applications scattered across multiple monitors can switch between the available remote displays or merge all displays on a single screen. The handy keyboard shortcut Ctrl-Alt-I additionally identifies the displays by number, particularly useful for remote set-ups with numerous monitors. Maximum freedom in display resolution - Dynamically change the resolution of your remote desktop to fit your specific requirements via the 'Resolution' slider in the 'Display settings' menu. 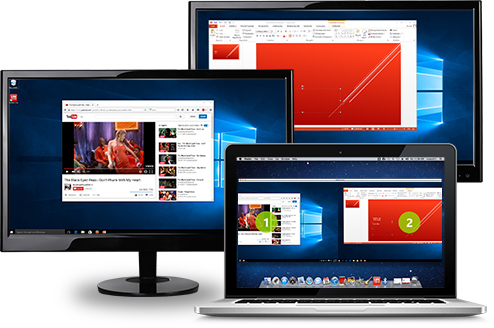 In remote desktop sessions to multi-monitor set-ups, users can even set a custom resolution ad hoc per display. Holding the 'Control' key whilst dragging the corner of the window will automatically scale the contents to fit the window preserving the aspect ratio of the remote display. Screen blanking - Users on all platforms can protect their privacy and hide screen content by blanking the host display. It's also possible to prevent unwanted user input by locking input devices during a remote desktop session. Full support for headless Linux servers - NoMachine can easily be installed on headless Linux servers out of-the-box. Connecting to a headless Linux server, such as a Linux desktop running in a datacenter or in a cloud provider environment, no longer requires manual configuration. Kerberos ticket-based authentication via NX protocol - Support for Kerberos ticket-based authentication is extended to connections via the NX protocol. Enterprise users can select from SSH, System Login and NX Login in the connection GUI and start the connection without having to enter credentials. Unmatched performance - Sophisticated algorithms refine the screen to recreate crisp original colours without impacting on performance. NoMachine can take advantage of the graphics card capabilities server-side, effectively reducing CPU consumption. Support for Nvidia cards with Maxwell architecture has also been added. Optimized remote node management - Once connected to a remote server, NoMachine administrators can add and remove nodes directly via the Player GUI rather than executing operations via the command line. Extended support for remote X-Window hosts - Any remote Unix server supporting the X-Windows protocol, including Solaris, AIX, HP-UX, BSD and Linux, is treated as a NoMachine node and added to the cluster network just by using the administration GUI.